Thanks for another highly successful campfire. Chatroll reports that 166 people participated in our 140-minute marathon chat. Thanks for your support on a Saturday night, no less. Hey everyone. In accordance with the Sunshine Laws of the State of Alabama, I am serving notice of a Campfire to be held tonight at 8 p.m. CST. Be there or be rectangular. Topics will include, but are not limited to: Baltimora vs. Breakfast Club as top one-hit wonder act of 1986, Mary Pierce vs. Roberto Alomar, James Willis, Stacy Searels, Yuengling and more denials about my alleged dealings with ESPN. Here is Tim Tucker's (short) story on the Atlanta Journal-Constitution's web site, which quotes UGA coach Mark Richt saying Stacy Searels will stay at UGA. Searels, an Auburn graduate, has spoken with Gene Chizik about being a part of the Tigers' staff. I'm not off the case here just yet. Gene Chizik made the first shrewd decision (and first overall) of his tenure today by re-hiring linebackers coach James Willis as part of the Tigers' staff. Willis, a former Auburn player and NFL veteran, has spent the past two seasons coaching on the Plains. 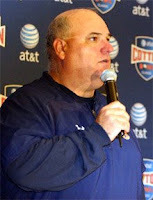 In addition to his on-the-field duties, Willis was considered the team's most valuable recruiter. He's been working to make inroads in the coveted Mobile area, which is considered a hot zone for Alabama's recruiting efforts. Willis will continue that work under Chizik. He is the first assistant coach named to the Tigers' new staff. IN WITH THE OLD: Four other long-time employees have been retained. Strength and conditioning coach Kevin Yoxall will remain in his role. Jimmy Perry (director of football operations), Phillip Lolley (director of NFL relations) and Chette Williams (team chaplain and FCA czar) also will remain on staff. Hey everyone. Hope you had a swell Thursday. I snagged a Blu-Ray player, which was a nice surprise. Also snagged Discovery Channel/BBC's "Planet Earth" on Blu-Ray DVD. I'm in good shape. What about the Auburn Tigers? STILL NO STAFF: Gene Chizik, your new football coach, hasn't yet announced even a single hire. His coaching staff is barren. I'm 100% sure he already has come to terms with at least a few guys. Timing is the thing. I'd start looking for announcements next week, though I don't expect that staff to be filled out and working together until the first week of January. STILL NO MAJOR RECRUITING CHANGES: Auburn has "lost" some recruits, though that's bound to happen with a regime change. Some kids loved the former staff and wanted to play only for them. The current head coach perhaps isn't enamored with some of the current or former commitments. This will take time to sort out. The new and obviously aggressive approach Chizik is using will yield some short-term gains. This kind of stuff always does. 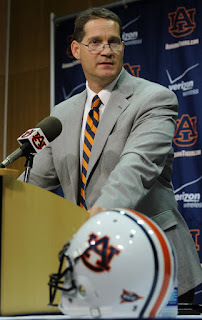 Parlaying that initial interest into a long-term advantage will be the key to Chizik's long-term employment prospects. CHIZIK ASSERTS HIMSELF LOCALLY: Chizik rolled into the houses of several top recruits -- including star Gadsden cornerback Dre Kirkpatrick -- and at least set a tone for The New Auburn. Will it work? A lot of people are impressed with Chizik's gumption. Sorry to drop back-to-back videos, but this one was just too joyous -- and too 90s -- to hold back another minute. Plus, happy vibes spawn more happy vibes. And so on. I'll be back later today for some Auburn-themed chatter. Big Christmas ups to all HOTTIES for making this the aptly named haven for intelligent and rational Auburn discussion. I'm mighty thankful for the HOTTIES, who make my life better every single day. Keep it real like I know you do. Here's a little gift: Run-DMC's holiday hit from 1987. *Monica posted this on facebook yesterday. Hey everyone. The San Diego Union-Tribune reports that former Auburn coordinator (and current employee via buyout) has been hired as an assistant at San Diego State University. He'll be the Aztecs' offensive coordinator if the Union-Tribune's unnamed sources are correct. Good for him. I like SDSU. I love that city. Wish I could live there myself. CAMPFIRE LOVE: Thanks to the HOTTIES who braved the elements to participate in our Christmas Eve Campfire. Attendance wasn't the best, but the company was incomparable. Hey everyone. It's Christmas Eve here in lower Alabama, which means it's a festive time. Hope you're having a swell time. 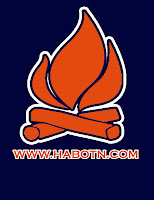 The HABOTN, in full accordance with the Sunshine Laws of Alabama, is hereby serving notice that we'll be holding a Campfire® today at 2 p.m. CDT. Please stand ... and sing. Thanks to the 426 HOTTIES (total participants) who attended our 144-minute campfire. HOTTIES > every other person on Earth. Rumor has it that we will re-convene tomorrow (12/24) for another afternoon chat. I'll probably have nothing new to discuss, but that doesn't mean we can't have fun. Hey everyone. We're going to hold a Holiday Campfire today at 2 p.m. Topics will include Gene Chizik, Judy Garland, Stacy Searels, Simon Le Bon from Duran Duran, Thomas H. Tuberville, FSJ's fear of tattoo pain and other scintillating topics. For the uninitiated: A chat window will appear here at 2 and we'll chat. Have a joyous late morning and early afternoon. 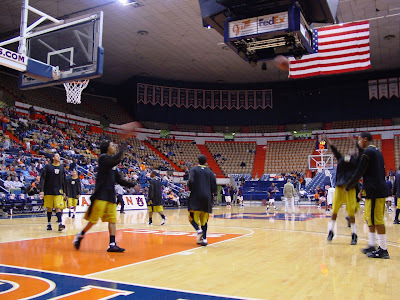 We're live blogging the Alabama State @ Auburn basketball game. It's time for the second half. Auburn 70, ASU 63: Tay Waller throws up a prayer at the 1:00 mark, Johnnie Lett tips in the miss. That's where the Tigers are right now -- nothing can go wrong. 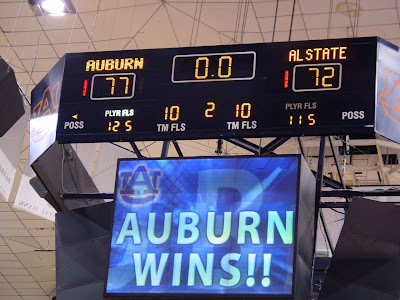 Auburn 68, ASU 63: The Tigers went on a 17-0 run. That turned an 8-point deficit into a 9-point lead. ASU just scored a couple quick baskets to add some intrigue. Auburn 61, ASU 59: The Tigers have forced turnovers on six consecutive possessions. That's one charge and five problems with pressure defense. It's a pretty impressive deal. ASU 59, Auburn 57. Full-court pressure is doing this. ASU isn't dealing with it well and that's creating major problems there. This team has a lot of seniors; surely a minor adjustment can fix this particular issue. ASU 57, Auburn 51: The Tigers have some life in them after all. They're playing more aggressively right now, though someone needs to tell Lucas Hargrove that he's not a point guard or a point forward or whatever he thinks he is. That's not working. ASU still seems rushed. Not sure why. ASU 48, Auburn 40: The Tigers are just getting out-played right now. Barber is playing aggressively and doing his job. Can't say the same for the rest of his team. ASU seems more impatient than it should be given its current situation. They ought to be milking this. ASU 43, Auburn 37: The Tigers seem content to let Brooks fire away from outside. He's lighting them up. This ASU has play-makers, I'm telling you. All I have seen from Auburn so far is Tay Waller. ASU 35, Auburn 35: Tay Waller is heating up. He already has eight points in this half. He's hitting everything. Auburn was called for a technical foul. I'm not sure what was going on there. I think that was on Waller. Lemme see what I can find out there. UPDATE: It was on Waller for unsportsmanlike behavior. Thanks to Kristina and Earl for stopping by at halftime. Welcome. I saw the guy who coordinates program sales earlier and he was asking for more, so that means there are 1,000 people here. I'm amazed. ASU 29, Auburn 24: And it would have been worse if Tay Waller hadn't hit a double-clutch three with less than a minute remaining. The Hornets are playing with more fervor overall, though Barber is bringing it. Frankie Sullivan is off his game. Waller hasn't been a big part of the offense. Nobody is playing an assertive role for Auburn. ASU 23, Auburn 21: The Hornets went nearly seven minutes without a bucket until just a moment before the timeout. Their turnover problem is back. Auburn has been getting some decent shots and missing them. Nobody has a hot hand, per se. ASU 21, Auburn 17: Barber scored on a nice hook shot. The Hornets' offense makes sense, but the last few shots were lazy. They stopped attacking the inside. Surely they'll go back to that. Clock problem. Looks like the shot clock is buggin'. ASU 21, Auburn 15: The Hornets hit threes on back-to-back possessions and the home team looked confused on offense. That's a reset. Auburn 15, ASU 12: The Hornets' point guard, Brandon Brooks, wears a mohawk. That's pretty cool. ASU has some play-makers, so the Tigers won't be able to blow this team out. This game is competitive. Auburn 9, ASU 7: The Hornets were sloppy early, committing turnovers on four of their first seven possessions, but seemed to settle in. Auburn seems to be moving the ball more fluidly around the perimeter. Passing is more crisp than the last time I saw Les Tigres. Hey everyone. I hope you're enjoying your NFL Sunday. Or your Christmas Shopping Sunday. Or whatever you're doing this fine Sunday. I talked earlier today with DeMarco McNeil, the former Auburn defensive tackle who spent the 2008 season as the team's graduate assistant. He spent two seasons playing for Gene Chizik, spent a season coaching at Auburn and grew up in Mobile. Could his affable personality and lower Alabama roots make him the kind of dogged recruiter Chizik needs in lower Alabama? 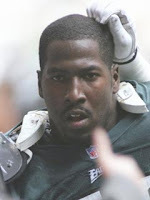 ``I'm just waiting to see what happens," McNeil said. 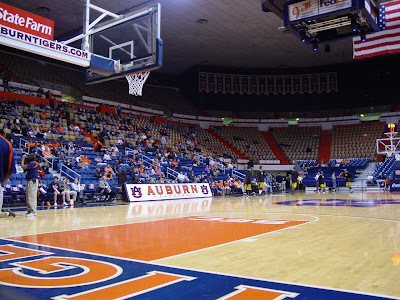 ``I love Auburn. I'd love to stay at Auburn." Chizik is expected to begin taking tangible steps toward assembling his staff this week. He spent the past six days -- the first six days of his tenure -- trying to repair damage done to the program's recruiting efforts. Tuberville's sudden departure and the subsequent fallout created tension that Chizik has been trying to soothe. He has met with high school coaches in at least four states since being hired on Dec. 15.